The revisions to the Senate health overhaul bill released today would require future Congresses to increase taxes and cut Medicare even more deeply than required by the Senate bill if the advertised deficit reduction numbers are to be achieved. That was the conclusion of four budget experts who talked with journalists on a conference call this afternoon sponsored by the Galen Institute. “The numbers simply aren&rsquo;t plausible,&rdquo; said Douglas Holtz-Eakin, former director of the Congressional Budget Office and president of the American Action Forum, during the call. The CBO estimates that the latest version of health reform legislation released today would reduce the deficit by about $130 billion over the next 10 years. “Even at face value, that is a very small net deficit reduction that amounts to only a few weeks of federal spending at current rates,&rdquo; Holtz-Eakin said. Blue Dog Democrats may well want to ask themselves whether the risk of this massive experiment in overhauling one-sixth of our economy and creating a huge new entitlement program would be worth a few weeks of highly-unlikely deficit savings. And even that modest reduction is based upon a shell game that hides future Medicare cuts and tax increases, double counts revenues, and slows the growth of future subsidies for health insurance, he said. The 153-page fix-it bill assumes future congresses will be willing to cut Medicare payments to doctors by even more than the 21 percent that was scheduled for this year — but circumvented by the Senate bill — and cut them even more in subsequent years. No Congress has ever demonstrated any willingness to take such actions, according to Joseph Antos of the American Enterprise Institute (AEI) and formerly of CBO. Further, in order to pay back the labor unions for their support, the bill moves the trigger date for a tax on Cadillac health insurance policies to 2018, per an agreement hammered out with President Obama during closed midnight negotiating sessions at the White House in January. But the lost revenues are made up by indexing the tax on these high-end insurance plans at the rate of inflation (instead of inflation plus one percent) meaning the tax will affect more plans, more quickly. In addition, it would impact Social Security taxes, raising $53 billion over 10 years, Antos said. Social Security is strictly off limits in the rules that govern the reconciliation process “and that could foul-up the process through which the Senate plans to pass the reconciliation bill,&rdquo; he said. If this provision doesn&rsquo;t get past the parliamentarian, there will be serious questions about whether the added benefits can be paid for. The CBO did not address that problem in its letter to the leadership today, but it could blow an even bigger hole in its budget estimates if the Senate parliamentarian throws this out. As background, the legislative changes and cost estimates released today are based upon addition of a second health reform bill to be tacked on to the original Senate bill. The House is demanding the Senate pass this fix-it bill in exchange for its passage of the Senate bill. The House is taking a big risk: It must swallow the much-despised Senate bill whole, likely “deeming&rdquo; it to be passed alongside its fix-it bill. But the president must sign the House-passed Senate bill before the Senate can begin work on the second health reform bill containing these so-called fixes. Can they trust the Senate to pass its fix-it bill after they already have passed the original Senate bill and it is signed into law? Can the changes the House wants in its fix-it bill can pass muster with the Senate parliamentarian or will they be thrown out? Are they willing to be on the hook, perhaps permanently, for taking a vote for the Senate bill that may never get changed? Does the fix-it bill really makes the Senate bill that much better? Is this really health reform? 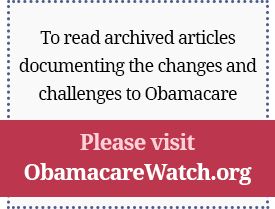 Previous Article: Blindsided by ObamaCare? “The numbers simply aren’t plausible,” said Douglas Holtz-Eakin, former director of the Congressional Budget Office and president of the American Action Forum, during the call. The CBO estimates that the latest version of health reform legislation released today would reduce the deficit by about $130 billion over the next 10 years. “Even at face value, that is a very small net deficit reduction that amounts to only a few weeks of federal spending at current rates,” Holtz-Eakin said. In addition, it would impact Social Security taxes, raising $53 billion over 10 years, Antos said. Social Security is strictly off limits in the rules that govern the reconciliation process “and that could foul-up the process through which the Senate plans to pass the reconciliation bill,” he said. If this provision doesn’t get past the parliamentarian, there will be serious questions about whether the added benefits can be paid for. The CBO did not address that problem in its letter to the leadership today, but it could blow an even bigger hole in its budget estimates if the Senate parliamentarian throws this out. The House is taking a big risk: It must swallow the much-despised Senate bill whole, likely “deeming” it to be passed alongside its fix-it bill. But the president must sign the House-passed Senate bill before the Senate can begin work on the second health reform bill containing these so-called fixes. Next Article: Blindsided by ObamaCare?